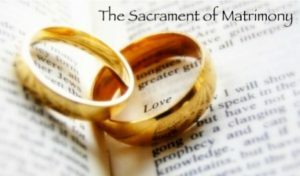 The celebration of marriage, like any other sacramental experience, is first and foremost the worship of the Church. Regardless of the event or occasion, sacraments are always an encounter with God for all who are present, and are not to be isolated to involve only a particular set of individuals. It is important to understand that the celebration of marriage is a sacrament, a religious ritual that celebrates not just the union of two people, but the reality of God’s love known in all people. Truly, a celebration of the Christian life. It is a call and challenge for all of us to deepen that love and to share the love of Christ throughout our entire lives. Marriage is a vocational call to a lifestyle. It is more than a witness contract agreed upon for the sake of financial stability; it is a vocational call to a lifestyle. The committed love of the couple must lead them to be of service to all God’s people and to help build and nurture the kingdom of God. We celebrate your decision to undertake this permanent and faithful covenant with each other and with God. Since it is your life vocation, it should be thoroughly prepared for and seriously considered. Contact one of the parish priests at the earliest time in your planning.